Supper Club is homage to the secret restaurant phenomenon. In this wildly creative and wonderfully eccentric cookbook by Kerstin Rodgers, owner of Londons famous Underground Restaurant, you will find Kerstins inventive and delicious recipes and themed menus, peppered with her helpful hints, tips and wild experiences. You will also be treated to Kerstins down-to-earth advice on how to run your own home restaurant, and a directory of other supper clubs of note around the world. In few other cookbooks will you find recipes such as elderflower fritters alongside home favourites such as Macaroni and cheese. Supper Club will appeal to home chefs and budding underground restaurateurs alike, and is a must-have for anyone who wants to experience the cutting edge of eating in. Former rock photographer and punk-at-heart Kerstin Rodgers started cooking professionally in 2005 for anarchist cafés, music festivals and anti-G8 camps. In 2008 she hosted her first food night at her home, calling it The Underground Restaurant, which is now a thriving business and cult-affair. Kerstin is well known in the foodie world both above and below the line. As her alter-ego, Ms Marmitelover she has featured in the national press and media for her extraordinary dining events, and has been named one of Londons most influential people. After a night in her restaurant, few would argue that. Kerstin lives with her daughter somewhere in London . . . but that is for you to find out! The Supper Club has received so many reviews on Amazon it leaves me struggling for words so here are just a few sample reviews to give you a feel for how special this book is. 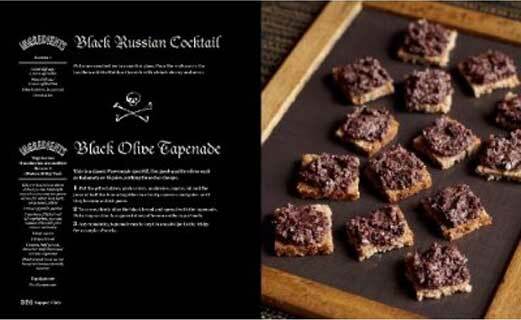 Having visited Kerstin's amazing supperclub last year, I was so excited to hear that she had a book coming out. The book arrived a few days ago and it is gorgeous! The design is beautiful and even has a lovely ribbon. But the best thing about the book (other than the delicious recipes, of which there are many) is Kerstin's writing, which is friendly and funny. It's a cookery book but it's also a glimpse into what it takes to run a restaurant from your own home, complete with a how-to list and a directory. This is the perfect book for the aspiring supper club chef (and for the rest of us who want to make something a bit special at home). 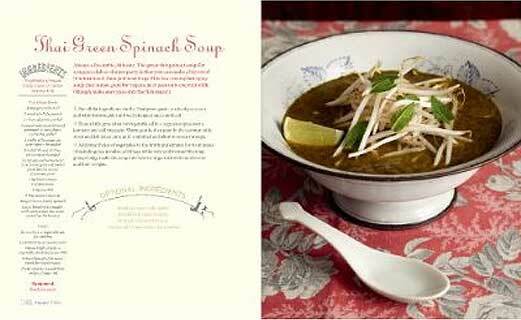 This book is a fun, inspiring cookbook that has a lot of personality to it. The design is great and well thought out from the photos to the pink ribbon bookmark. It is not just a book of recipes, it has stories to both introduce the idea of the "Supper Club" and to go along with many of the recipes. It is a book about community, food and creativity. Nowadays too many cookery books are cheap tie ins with TV series, cookie cutter products that are a dispiriting read. Kerstin here has produced the antithesis, A book where her joy of cooking and life shines from every page. Of all the cookery books I have read in the last year I'm sure that this one is the one which will still be in my kitchen in five years. I didn't think a book could possibly capture the spirit of a dinner at the Underground Restaurant, but I was proved wrong. This book is such a treasure to read. 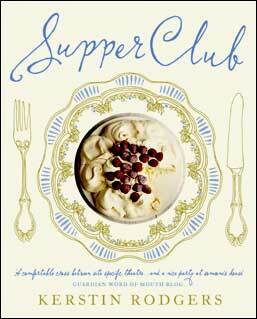 The photos, written passages, and recipes come together to confirm what makes the supper club so enjoyable . . . the fun in delicious food, sharing a meal with delightful people, and being in a welcoming home. 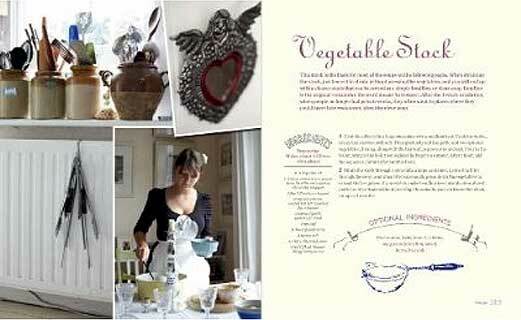 This book is a treat not only for my own home, but is a gorgeous gift for any occasion. Having become really interested in secret supper clubs recently I was overjoyed to hear about this book coming out, especially as it is written by one the original founders of supper clubs in the UK. Visually it is an absolutely stunning book, from the pretty front cover, to the pictures of the food, to the lovely extra touch of the pink ribbon as a book mark. It really sums up the magic and thought that goes in to making supper clubs what they are. The recipes are all really interesting and creative without being too challenging for those who already have a passion for cooking and working with food. It is also a book that you want to to sit down and actually read as it gives a really good background of supper clubs and Kerstin's own experience in them as well as tips for setting up your own and is such an inspirational and funny read that by the end I was desperate to set up my own! And the last word is mine! If you get yourself a copy of the book, and you really should, then do make sure you read the Twitter Curry page . . . really hot! It certainly had me laughing, not one of those quiet laughs to yourself, but one of those burst out loud laughs which gets everyone in the room looking at you! This ice cream has a subtle pastel colour and a clean, unusual flavour. When you think of mint ice cream, you probably think of the classic mint/choc chip. Using fresh mint transforms it. A revelation, even. Warm the milk, sugar, salt and half of the cream in a saucepan over a low heat, until the sugar has dissolved. Take the pan off the heat and add the mint leaves, leaving them to steep for at least 1 hour. Return the mixture, now including the egg yolks, to the saucepan, whisking all the time. Warm gently again for about 10 minutes until it starts to become like a custard (coating the back of a wooden spoon), then strain into a bowl. Leave to cool. To make ice cream, I use a Kitchen Aid ice-cream attachment. I find that if I chill my mixture too much, the paddles keep getting stuck. So I let it cool down but I dont refrigerate it. Once cool, pour the mixture into your ice-cream maker and leave to churn for at least 30 minutes. You will see the mixture start to thicken. Take a small jug of melted white chocolate and pour it into the churning mixture, trying not to get it on the paddles. The chocolate should form little iced flakes within the ice cream. Once churned, pour the ice cream into a plastic container and freeze. 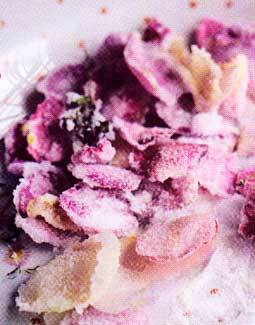 To serve, decorate the ice cream with crystallised flowers. Its beautiful present in a flower ice bowl. This is a dish from the movie Like Water For Chocolate that I cooked at my Film and Food themed night, where I quoted dishes from famous foodie movies. Normally this dish is served with meat, but mine is a vegetarian version. Poblano chillies, which arent too hot, are hard to get hold of in Britain, so I ordered them from www.southdevonchillifarm.co.uk. If you cant find them, use green or red peppers, jalapeños or grilled slices of aubergine instead.. Prepare the walnuts the night before, if possible. Put them in milk and leave to soak overnight. The following day, their skins should come off easily. Otherwise just grind up your walnuts, ideally without skins, though Ive found it doesnt really matter that much. Put the walnuts into a pestle and mortar or a food processor, add the remaining sauce ingredients and mince finely. Transfer the sauce to a bowl and set aside until needed. Put your chillies in a dry frying pan and cook over a high heat until the skins blister. Turn them until all sides are black and blistered, but make sure they dont burn through the shiny skins. Then put the chillies into a plastic bag, seal and leave for 15 minutes. This makes the skin easy to peel off. Meanwhile, make the stuffing. Heat some olive oil in a saucepan over a low heat and gently cook the onion and garlic until soft and translucent. Grind together the peppercorns, cloves, cinnamon and almonds with the pestle and mortar, or in the food processor. Add to the onion and garlic mixture and heat through. Add the raisins, tomatoes and other fruit until you have a firm mixture. Allow to cool. Preheat the oven to 180°C (350°F), Gas Mark 4. Remove the chillies from the plastic bag and peel away the skin. Slit each chilli neatly and carefully remove the seeds, leaving the top with the stem intact. Fill them with the cook stuffing mixture. Bake in the oven for 20 minutes. 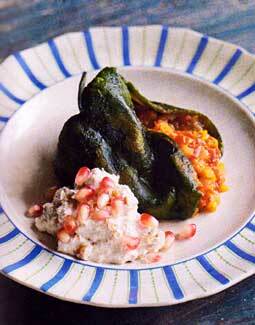 Place the stuffed chillies on plates, cover with walnut sauce and garnish with pomegranate seeds and parsley or coriander.